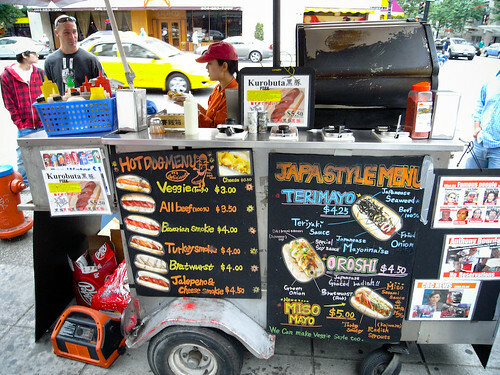 For those who haven’t heard (listen up Ice Cube/Jin from LOST/Anthony Bourdain/Steven Segal), Japadog – creator of the famous Terimayo hot dog – has opened up a 2nd location on Burrard & Pender. 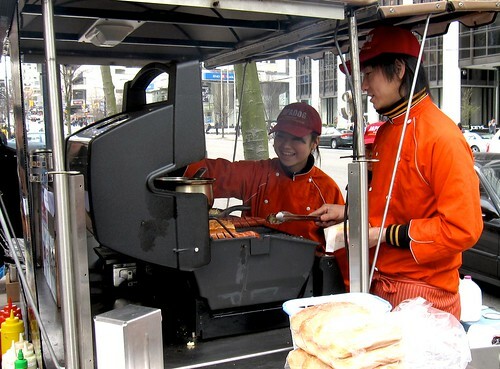 With the same cheerful smiles and a slightly larger cart, they’re armed with a few additions to their already innovative menu. Of the few times we’ve ventured down, there’s always a crowd gathering at the stand. Ed: I went with the Korrokke. Taste? Think steak and potatoes in a bun. Not bad. Very unique and definitely filling. 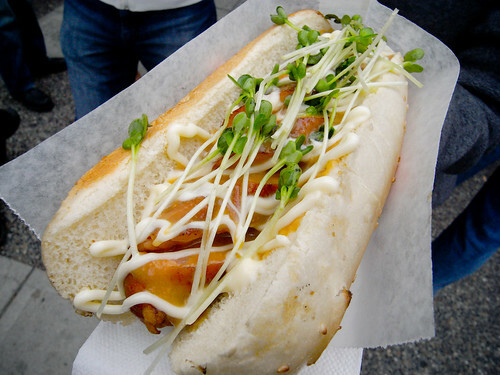 However, as intrigue as my weiner dog with a Japanese name was by this Japadog, Terimayo is still tops for me *high fives Anthony Bourdain*. Dan: My first try was the Okura. Never had this veg before, and I’m not a fan of the natto-like texture, but its worth a taste. Dan: Last is the Sakana fish sausage. They must have been using tropical fishes in this sausage cause the weiner is bright pink, and reminds me of bubble gum and cotton candies. But the tuna on top does make up for it somewhat. If you happen to be a non red meat eater, this is a good alternative to tofu dogs. But I’ll stick to old fashioned beef. 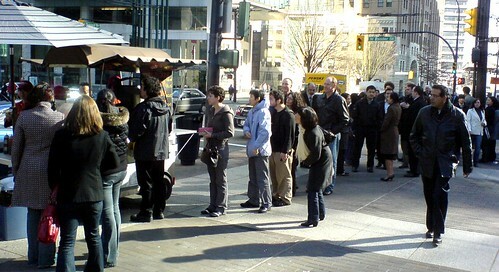 Ed: All in all, we’re not crazy about the new flavors but you can never have too much Japadog in our opinion. 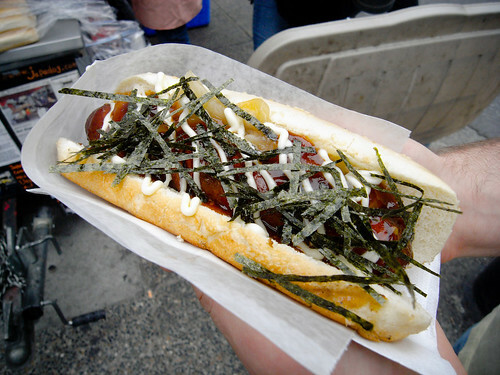 And, in case you find yourself constantly forgetting about Japadog, follow @japadog on Twitter to get bombarded with informative updates like, “How are our friends today? Pay Day? Celebrate weekend with Japa Dog! =)” every single day. Still not enough useless content? Follow us as well: @danielwu & @eddie_chan. The office recently moved downtown, opening up a whole new set of lunch options. Luckily for us, the best hot dog stand in town is just around the corner. Vancouver always touts its multiculturalism proudly, and so does Japadog on Burrard and Smithe, where “east meets west deliciously” as tastethehappy puts it. Its fusion food in a bun. More precisely, they serve hot dogs with a Japanese makeover. I know, its hard to imagine if you haven’t seen it before, and I had trouble explaining it to my coworkers without visual aid. Take their Misomayo for example. Turkey sausage with Japanese mayo, miso sauce, and radish. 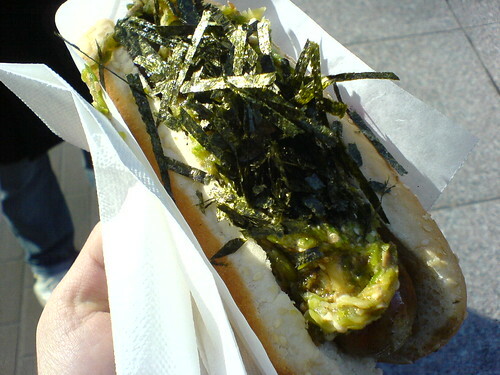 Or Terimayo, their #1 export, beef hot dog with Japanese mayo, special teriyaki sauce, and seaweed toppings. 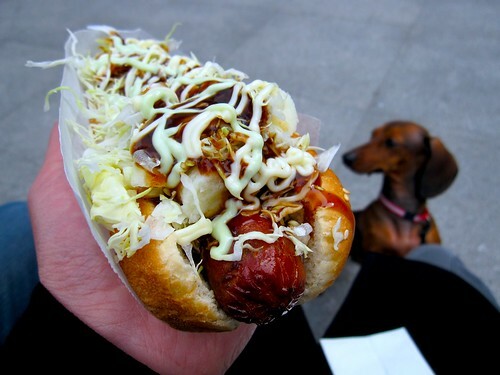 Its more than just a gimmick, as these dogs taste pretty good with the Japanese toppings, and almost makes you forget what your momma told you about eating too much fast food. They do have other types of sausages, leaving the choice of condiments up to you. I also noticed their stand is cleaner than some restaurants I’ve been to, which is always a plus. These guys are pretty famous too, making the news on numerous occasions, and proudly displays mug shots of B-list celebrities that have visited them, such as Steven Segal. As far as hot dogs, cheap lunches, creative cuisines, and fusion food goes, this ranks pretty high up there. Just in case you weren’t following up on hot dog related news, Joey “Jaws” Chestnut recently defeated Kobayashi “Tsunami” Takeru in Nathan’s hot dog eating contest by slaughtering 59 dogs in 10 minutes. 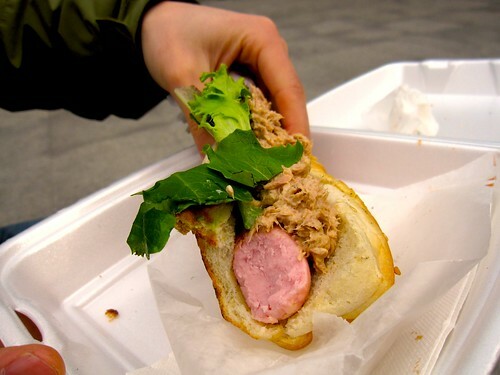 That’s almost 1 hot dog every 10 second, and nearly 20,000 calories in total. Fortunately for those two, I only had enough cash that day to buy one.